Bubbles was the teenage girl always ready for a walk or a ride, smell everything, see everyone and be the center of attention. Bubbles lead the way on walks, into the car and first out of the house. Bubbles had a thick, smooth coat and I believe she would stand all day to be petted and groomed. Bubbles was protective of her home, so squirrels and birds needed to be careful when entering the yard as her running skills were still fine tuned as she would run circles around the yard as demonstration. 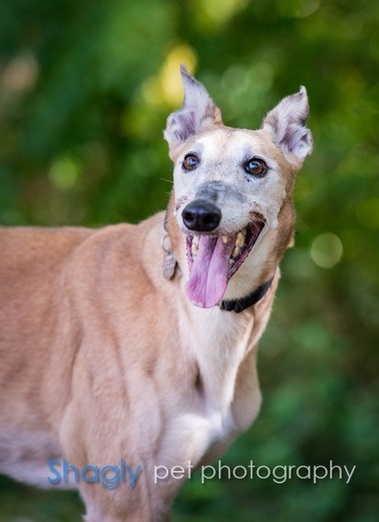 Bubbles had a favorite spot in the grass behind the pool and garage and on sunny days would be upside down on the grass with her tongue hanging out with that greyhound smile. As long as we were outside she was outside but as soon as we began walking to the door, she was up and waiting at the door before we arrived. Bubbles was unique and I miss her grinning smile and laughing eyes.